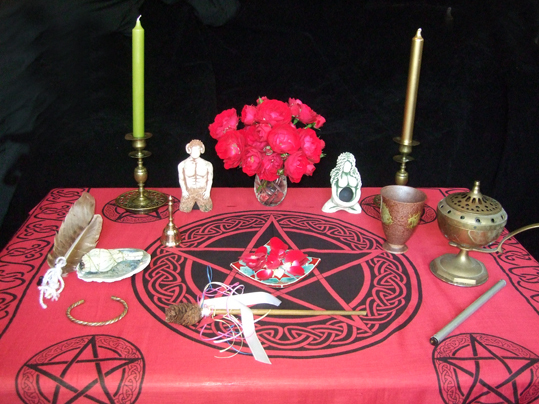 Doesn't my Summer Solstice altar look rather gorgeous? I have Wicca Moon to thank for it. That lovely red altar cloth, offering plate, bell and bracelet were just some of the items in the Litha ritual kit from the pagan supplier. I've been getting Wicca Moon's Wheel of the Year ritual kits since Imbolc. As well as containing an actual ritual to do and things like seasonal incense, anointing oils and candles, each box includes altar tools. They gradually build up over the course of the year if you get each set - although you can buy individual sets on their own. For Imbolc I got the sage bundle, shell, feather fan and chalice as well as a white altar cloth. 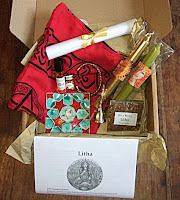 Ostara's box contained the lovely Goddess statue and a little flower pot for planting blessed seeds.The God statue and wand were among the goodies in the Beltane kit. The red roses came from my own garden and I put a few petals on the offering plate to be blessed during the ritual and then sprinkled onto the earth. I'm so looking forward to doing my ritual at the Summer Solstice next week and in the meantime I can enjoy looking at all the lovely things on my altar. Yes, I do realise I'll have to refresh the flowers nearer the time, but it can be a meditation on the cycle of life to watch the flowers on your altar in every stage.